We fell in love with Sarabeth's after tasting the most delicious pancake. Now we love Sarabeth's for another reason: Sarabeth's Award-Winning Legendary Spreadable Fruit (we knew we had something in common with Oprah). Sarabeth's fruit spread is AMAZING. That's all we need for breakfast- one of their fruit spreads with one of their delicious breads. 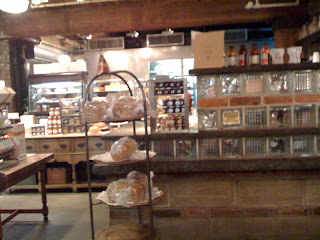 When you walk into Sarabeth's Bakery at the Chelsea Market, you smell nothing but buttery sweetness. We wonder if they hire someone to mop up the drool puddle from the door to the cash register. We were salivating. The bakery is simple, with just a few tables, no waiters, and a view of the small bakery - far different from their restaurants. Jennifer's Dream Omelet was exactly that, a dream. 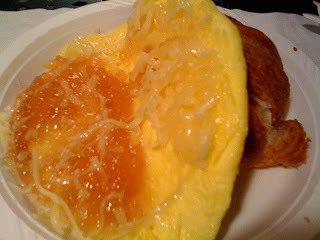 The Jennifer Omelet was probably one of the sweetest and most unique omelets we've ever tried. Sweet jam with cheese sounds like a strange mix but it was decadently good, without the decadent price (a bargain at $7). 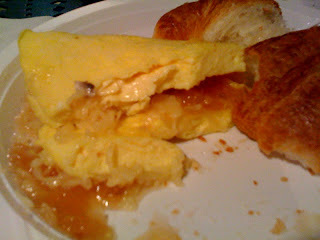 The egg was thick, fluffy and perfect, the jam was, well, legendary, the cheese was smooth and light, and the croissant that came with it was near perfection. Also, what a great name for this omelet. Oh, and their lemon buttermilk cake - FANTASTIC! Not bad for what started out as a small family business out of a Manhattan apartment. Sarabeth's is now something of a global business - with the fruit spreads being sold in the the Caribbean, Canada, Japan and South Korea. The jams are still produced in New York (in a factory in the Bronx) and the business is still being operated by the founders Sarabeth and Bill.